This represents '#pragma omp single' directive. In this example directive '#pragma omp single' has clauses 'private' with the variables 'a' and 'b' and 'copyprivate' with variables 'c' and 'd'. Definition at line 1399 of file StmtOpenMP.h. Definition at line 1443 of file StmtOpenMP.h. Definition at line 284 of file StmtOpenMP.cpp. 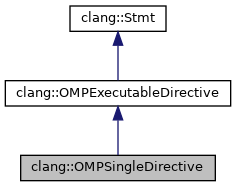 Definition at line 300 of file StmtOpenMP.cpp. Definition at line 1400 of file StmtOpenMP.h.